B. Have it repaired by an authorised person. C. Use high speed duct tape to hold it together as it is waterproof. Correct. Cracks and loose padding will reduce the effectiveness of the helmet in a crash. Your helmet is your lifeline in the event of an accident, so you’ll need to choose one that is perfectly fitted to your head and your requirements to help it give you the maximum protection possible. It is illegal to ride a motorbike on the road without wearing a helmet, so let's find out how you can get one that suits your needs. 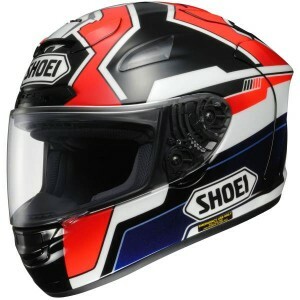 You can read our article here which outlines in depth all the safety standards a motorcycle helmet must comply with but, in brief, an approved helmet must conform to Australian Standard AS1698. Helmets can be damaged in ways that are not visible to the naked eye so you should never trust a helmet where you don’t either know its full history, or trust the person supplying it to you (e.g. in the case of hiring a gokart and helmet at a track). I still always take my own helmet rather than hire a helmet. Older helmets might not be up to AS1698 which was introduced in December 1990. Newer helmets are likely to have more modern materials and offer better protection. It’s difficult to purchase a helmet for someone as a helmet is a very personal object – it must fit perfectly and feel comfortable, and everyone’s head shape and size is different. Aerodynamics are important because at speed certain helmets can create lift. This is less of a problem on a motorbike where you can duck down than it is, say, in a single seater race car. Helmets alos have a certain amount of aerodynamic drag which can be fatiguing for neck muscles on long journeys if the bike doesn't have any farings or windshield to channel air around the rider. As all helmets have to meet a minimum standard, often you are purchasing additional features or a lighter weight when you spend more on a helmet, not necessarily extra protection. The heavier your helmet, the quicker your neck muscles will be fatigued. A heavier helmet also has more inertia in the event of a crash, i.e. it’s more difficult to make it change direction. An impact-absorbing liner material that is glued to the rigid outer shell. It’s usually made from polystyrene as it is both light but deformable in the event of an impact. Manufacturers optimise the deformability of this layer of polystyrene based on impact speeds used in standard tests. A retention system that is usually a chin strap to keep the helmet on your head if you crash. A full-face helmet covers the entire head and face down to the base of the skull and the lower jaw, with an opening for visibility (visor). 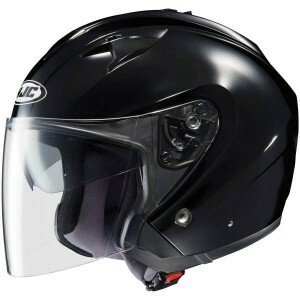 The full-face helmet provides the best protection and is the most popular type of helmet. It also has good aerodynamics and keeps the wind and projectiles off the rider’s face. Some riders might find them too heavy or bulky, and may feel claustrophobic. They do reduce the auditory experience, and can have ventilation issues. Usually there are ventilation holes to help keep the visor clear. The shape of the helmet affects its overall aerodynamic performance. 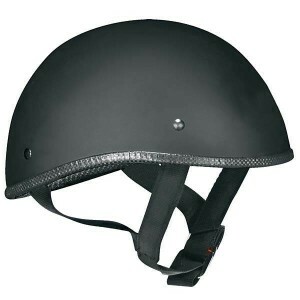 Modern helmets often have a semi-teardrop shape to help prevent lift. Open-face helmets are also called three-quarter helmets. They are lighter than a full-face helmet, with greater visibility. Riders must wear some kind of eye protection, such as goggles, but that still leaves the face exposed to flying projectiles and the weather. In the event of an accident the rider’s face is not protected at all and could be exposed to damage. Some open face helmets have a visor attachment (as shown). Open face helmets are not as aerodynamic as full-face helmets. They have the advantage of being able to eat, drink and talk without removing the helmet. A half helmet is a novelty style helmet that offers the least protection of all the helmet types. Often used by bikers and classic bike enthusiasts, they conform to the minimum regulations. 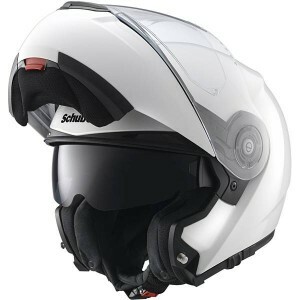 They are often lighter and more comfortable to wear than a full-face helmet and offer good visibility, but they have no face protection in a crash and offer poorer aerodynamic performance. Your eyesight can be seriously damaged if you are hit in the eye by an object when riding at speed, therefore you should always wear a goggles with a half helmet. There is usually not the structure in the helmet to be able to attach a visor, therefore other eye protection is needed. In a modular helmet, the entire front flips up to form an open-face helmet for use in hot weather or low-speed city traffic where greater visibility to pedestrians might be desired. With the visor down the head protection is similar to a full-face helmet, but with the added advantage that the visor can be flicked up to allow communication with another person or to take a drink, for example. They are, however, heavier than full-face helmets because of the extra moving parts and bracing. Motocross helmets are more specialist and are designed for off-road riding where the rider might wear goggles with tear-off strips to keep them clean. They have an extended chin guard and sun visor. The larger chin guard and more open design leads to less fogging issues during the greater physical exertion that’s usual with off-road riding. The goggles are not as protective individually as a clear visor, but when combined with the sun visor and extended chin portion, the overall protection is similar. 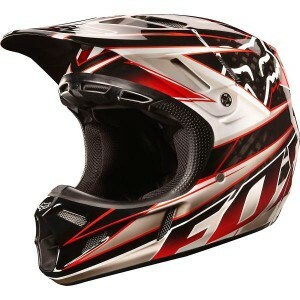 Motocross helmets are much less aerodynamic than full-face helmets and this can lead to neck fatigue on longer journeys. If you have an accident in your helmet, or if you find any cracks in the shell or frays in the strap you must replace your helmet as it might not protect your head in a further impact.